niche for himself not only in schoolbooks (at least the ones he has not been removed from), but in the minds and hearts of many republicans. His dedication and devotion to his cause backed up by a feisty and furious personality have helped turn him into a romantic figure. He grew up with war and aimed for peace, but was killed in the attempt. Some goals take longer and are more difficult to reach than some might think. Neil Jordan's determination to bring this story to the screen has finally paid off thirteen years after he wrote the first draft of the script. The Easter Uprising at the O'Connell Street Post Office came to an end when Irish revolutionaries surrendered after a six day stand-off. 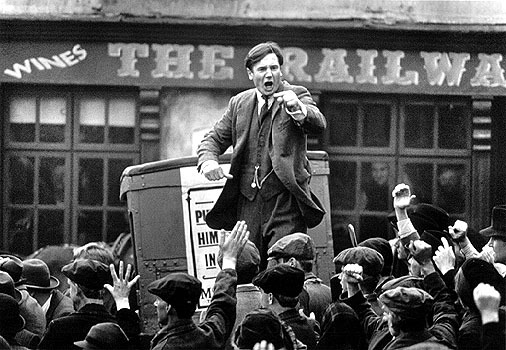 All of the leaders, with the exception of American citizen Eamon De Valera (played in the film by Alan Rickman), were executed and many followers, including Collins (played in the film by Liam Neeson) and his friend Harry Boland (played in the film by Aidan Quinn), were imprisoned. They became, upon release, the new leaders of the Irish Independence Movement. Collins travelled the country and made speeches. He also organized the Irish Volunteers, a secret force that attacked the oppressive British army and police. He masterminded prison escapes, created underground intelligence networks, and organized the obtaining of weapons until Irish began to once again take control of their own country. The British black-and-tans were sent in to retaliate. De Valera went to America to appeal for support while Collins brought the British to the breaking point at home in Ireland. Then came the treaty that established the Irish Free State and the rest, as well, is history. Collins wrote, at the time, "Let us not waste our energies brooding over the more we might have got. Let us look upon what we have got ... Let us realize that the free Ireland obtained by the Treaty is the greatest common measure of freedom obtainable now, and the most pregnant for future development. The freedom we have got gives us scope for all that we can achieve by the most strenuous united effort of the present generation to rebuild Ireland. Can we not all join together to save the Irish ideal -- freedom and unity -- and to make it a reality?" This film is epic in its content and epic in its presentation. No wonder, it does have to tell the story of the "Big Fella". He was a controversial figure then and remains one still. Director Jordan explains, "When you see the 20-year war of attrition that happened in Northern Ireland, you realize the power of the forces that were arrayed against him. At school we were fed very simplistic versions of these very painful and complex historical events. People couldn't tell the story of these events for a long time because they'd been psychologically maimed by them". Neil Jordan grew up in Southern Ireland and Liam Neeson grew up in Northern Ireland; together they've made a remarkable film. Superb points for director Jordan and producer Stephen Woolley (once again a winning team) and for the performances of Liam Neeson in the title role as well as Alan Rickman as Dev. Special mention for Chris Menges, now known as director himself, for returning to fulfill the task of lighting cameraman on a project that he became intrigued with many years ago. Menges has created a visual gem. Those who are interested in investigating more of the history might be well advised to read Tim Pat-Coogan's book Michael Collins.